Somehow or other, people are drawn to activities that require some level of prediction such as betting (I personally predicted a 2-1 win over the Italians by the French at this summer’s World Cup but was sorely wrong) and weather reports. Nearly everyone relies on the weather reporter as they plan out the next day’s activities such as leaving the clothes out to dry before heading off to work or playing a round of golf. This is where home gadgets like the Oregon Scientific Weather Forecaster comes in handy, capable of giving you what the news report will minus the irritating advertisements. The Weather Forecaster not only tells you of how the weather will be via the LCD display, it also comes with a color changing base to reflect the current weather outside. In addition, it is capable of measuring the indoor temperature as a bonus. To round off the list of functions of this impressive 4-in-1 device, the Weather Forecaster is equipped with a radio controlled clock. 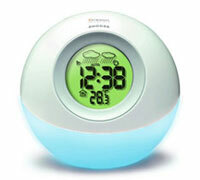 This clock boasts an 8 minute snooze function that ought to get you out of bed sooner or later. You can now wake up and know how the weather for the rest of the day is going to be like with the Weather Forecaster. It is amazing to see so much technology packed into a device that retails for just £29.95. Unfortunately, the Weather Forecaster will have to remain by your bedside as it is powered by a 4.5V power adapter and does not run on batteries, so you can forget about bringing this on your camping trips.